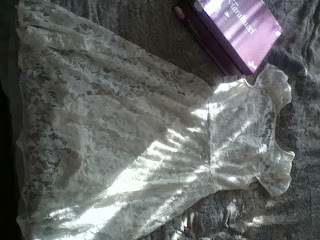 Today I went to North Shore to buy me and my sister dresses for White Sunday. In the picture above is my dress that my mum picked out. In the purple box is my shoes. I didn't want to wear it at first because it was really girly, but then my mum told me that she had made the order all the way from Europe, so I decided to wear them. I also went to the park and saw Samantha, Oh S'Mar and his brother and San Tat and his brothers. We played on the park, then Samantha had to go. Then I went back home and ate some ice blocks. Then I decided to paint a picture to go on my Auntie's wall. Overall the whole day was AWESOME! I think it is awesome that you are blogging every time I come on. Thanks for commenting on my posts. Your dress looks amazing! I bet your shoes looked beautiful! Have an awesome holiday Angel and keep up the great blogging! Your White Sunday Dress looks beautiful. Are you going to wear it this Sunday? You're very lucky to have your shoes come from Europe. Glad your holiday is going well. It is amazing the friends you bump into at the park. Keep up the great holiday blog posts.